Employees’ Provident Fund Organisation (EPFO), whose numbers the Centre often cites as evidence of formal job creation across the country, has crashed the government’s claim in its latest data released to the public. Net job creation in India’s formal sector has dropped 13 per cent from an average of 5.65 lakh jobs a month to 4.9 lakh jobs a month, according to latest data released by the Employees’ Provident Fund Organisation (EPFO). An earlier release of October had claimed jobs were averaging 6.1 lakh per month. EPFO’s Sept-17 to Oct-18 data had claimed 79.16 lakh new jobs averaging 5.65 lakh a month for the past 14 months. New numbers for 15 months between Sept-17 and Nov-18 released in January, 2019, have claimed only 73.5 lakh new jobs. That’s an average of only 4.9 lakh jobs per month in the past year and a quarter. The most dramatic downward revision in the new EPFO numbers have been in the month of March, 2018. 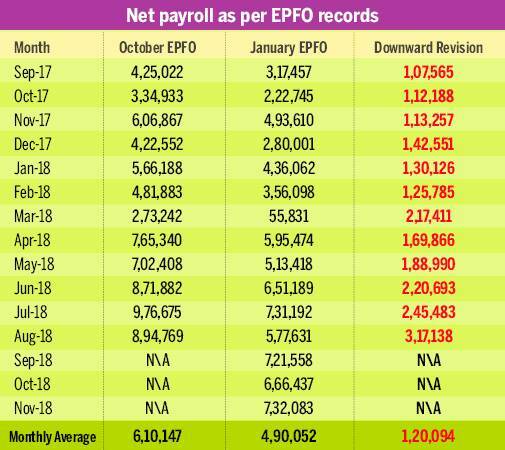 EPFO’s latest release records net additions of just 55,831 in March, 2018 as against 2.73 lakh claimed in the November release. In the past, EPFO officials have explained the forever changing numbers by claiming consolidation of multiple EPFO numbers into a single Universal Account Number (UAN) by employees over a period of time. Until EPFO’s UAN was launched by Prime Minister Narendra Modi on 1 October, 2014, employees would often get a new EPFO identity in every job. Job-hopping employees often had two or more EPFO IDs in their name. It was a discrepancy that was proposed to be rectified with a permanent UAN. However, old EPFO IDs are still being consolidated. A standard disclaimer in every EPFO release explains the changes in monthly numbers on the following lines: “Data is provisional as updation of employees’ records is a continuous process and gets updated in subsequent month/s”. It also says, “The estimates may include temporary employees whose contributions may not be continuous for the entire year”. Interestingly, just last week, several ministers at the Centre had lauded creation of 1 crore jobs since the government’s flagship job creation programme Pradhan Mantri Rozgar Protsahan Yojana (PMRPY) was launched on August 7, 2016. The 1 crore jobs claims were made before EPFO announced the new numbers which have downgraded job creation by 13 per cent. Under PMRPY, the Centre pays full employers’ provident fund contribution of 12 per cent for a period of 3 years for new employee registrations with salary of up to Rs 15,000 per month. It covers every employee registered with EPFO on or after April 1, 2016 in that salary range.